Of course, retirees pay all sorts of other taxes, including property tax and state sales and income taxes. But it’s essential for baby boomers to understand this federal income tax issue as they plan for retirement. The tax breaks for people over 65 are not “loopholes,” which require special knowledge or interpretations of the tax code, often by lawyers. Elderly tax breaks are explicit in the tax code. When applied to reduced retirement incomes, the tax preferences eliminate all tax liability for millions of older Americans. One such preference is a higher standard deduction for age 65-plus filers than for younger tax filers. Other provisions exempt the majority of retirees from paying taxes on their Social Security benefits. Another way to think about the impact of our over-65 tax breaks is that eliminating them “would make 16.3 million current nontaxable units taxable,” the Center’s 2011 report estimated. Many retirees’ tax liabilities are eliminated because we have a progressive U.S. income tax system that benefits low-income retirees and the elderly living in poverty, especially women. For example, nearly one in four older married couples and nearly half of single older individuals rely on their monthly Social Security checks for more than 90 percent of their retirement income. 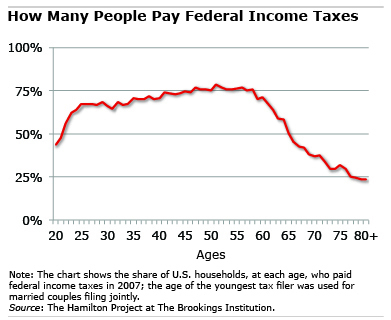 The elderly are a substantial group making up the vast majority of all tax filers who earn $30,000 or less and have no federal tax liability, regardless of their age. Even well-heeled retirees with investment portfolios pay a relatively low tax – no more than 20 percent – on their investment income and capital gains. The dollar value of these tax breaks going to higher-income workers and retirees is “much larger” than the benefits for low- and middle-income tax filers, the Tax Policy Center said. Retirement is a big adjustment for most everyone. But those who do have to pay federal taxes may be the lucky ones – they have more money coming in the door. My wife and I fall into the “[M]y annual tax liability is and will continue to be greater than when I was employed” category. Although neither of us ever made above $100,000 a year, we did save and invest. Our reward? We now pay tax on 85% of our Social Security benefits even though we already paid tax (FICA) on 50% of the money paid into our Social Security accounts. Rather than raise the Social Security taxable income threshold, Congress has opted to get its additional revenue from middle class wage earners. “we did save and invest. Our reward? 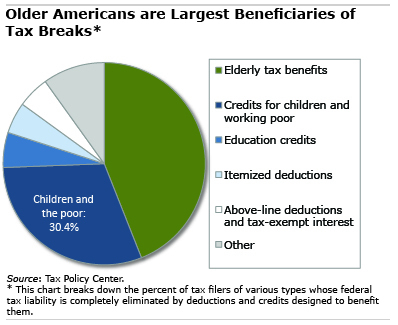 We now pay tax on 85% of our Social Security benefits…” Painfully ironic is it not? Financial advisers urge maxing 401(k), IRA, etc, but hit age 70.5 & Uncle Sam comes knocking. Taxes are due & that is expected – but paying taxes on 85% of previously taxed Social Security was a shock! Larry: I also pay taxes on my Social Security income albeit not as much as you (only 67% is taxable). However, I don’t see it as Congress getting additional revenue; instead it’s “Means Testing” and a reduction of Social Security benefits. I say this because the taxes we pay go back to Social Security. Even their website explains their revenue as Payroll Taxes, Interest on the “Funny Bonds” from the Government and Taxes paid on Benefits. (sarcasm is mine – they don’t say it quite like that) Regardless you’re absolutely right about the threshold. It hasn’t changed since Social Security started using the IRS to reduce your benefits. Larry: When working, you probably had other deductions which can no longer be claimed. For example, mortgage interest, dependents, business expenses, etc. Without these, you “pay more” than before. And you probably got tax-free health insurance from your employer, which you must now pay with essentially none of that tax-deductible. If its any consolation, the standard deduction gets a nice bump once you turn 65. Also a number of states exempt a certain amount of “retirement” income from state tax. Some like PA don’t tax Soc. Sec. or pensions at all. I also like those “senior” discounts even though sometimes I wonder why I get to pay less than the guy behind me with 4 kids. Remember, public employee pension and Social Security are exempt from state and local income taxes in New York State. There are similar breaks in many other states. And many breaks on property taxes, particularly for schools. I commented previously on the March blog post. Thank you for this clarification. As with Larry, my wife and I have a higher tax liability now that we are retired compared to when working. In addition to the causes cited previously, we are boosted into a much higher bracket because of the rule to take required minimum distributions (RMD) from IRAs. Although this is treated taxable income, it is merely moving cash from one account to another — thus creating a taxable event. Roth IRAs will, of course, avoid this. The bullet point says it all: Many retirees’ tax liabilities are eliminated because we have a progressive U.S. income tax system that benefits low-income retirees and the elderly living in poverty, especially women. For example, nearly one in four older married couples and nearly half of single older individuals rely on their monthly Social Security checks for more than 90 percent of their retirement income. I doubt that people in poverty read this blog or that Squared Away readers are anything but middle class. We are fortunate to be in financial position to pay taxes, eat well, go on vacation and have a comfortable life. Remember the following when you vote. Your Social Security Card – did you know? Just in case some of you young whippersnappers (& some older ones) didn’t know this, here’s a history lesson on your Social Security card. It’s easy to check out, if you don’t believe it. Be sure and show it to your family and friends. They need a little history lesson on what’s what and it doesn’t matter whether you are Democrat or Republican. Facts are facts. 1.) That participation in the program would be completely voluntary. No longer voluntary. 2.) That the participants would only have to pay 1% of the first $1,400 of their annual incomes into the program. Now 7.65% on the first $90,000. 4.) That the money the participants put into the independent ‘Trust Fund,’ rather than into the general operating fund, would only be used to fund the Social Security retirement program, and no other government program. Under Johnson, the money was moved to the general fund and spent. 5.) That the annuity payments to the retirees would never be taxed as income. Under Clinton & Gore, up to 85% of your Social Security can be taxed. Then, after violating the original contract (FICA), the Democrats turn around and tell you that the Republicans want to take your Social Security away! And the worst part about it is uninformed citizens believe it! If enough people receive this, maybe a seed of awareness will be planted and maybe changes will evolve. Which party initiated Social Security? Which party fought against it from its inception? So whoever said that politicians keep their promises? The ones who made the promises are generally out of office or dead. I am reading that “means testing” is being considered as one method to help fund Social Security. As someone who took the admonition to save as much as possible and to invest as much as possible to heart I find it ironic that by doing so I may find myself in the near future either getting a reduced Social Security payment or perhaps none at all because of being – what I consider – responsible. Was I fortunate to have been in the position to be able to save and invest? Absolutely. Did I live well below my means while doing both? Again certainly. Am I a bit taken aback [angry?] that my income may be reduced [and thus my retirement travel plans significantly cut back], you better believe it. Unfair? Er yes. The present system contains means testing to some extent. Those at the lower end of the income scale get much more back as returns on their original investment than those near the top. The Social Security Administration has compiled collections of proposals for addressing funding shortfalls. Means testing never appears. For good reason; as you point out, the incentives would be terrible. I think most talk about means testing is meant to get a rise out of a target audience. As a retiree, I paid no fed taxes for 2014. As a self-employed professional, I was always aware that my retirement was going to be “on me.” After the first few years of educational debt and start-up expenses, we started banging away at the retirement contributions in every venue available to us: my 401(k), my wife’s deferred compensation plan, etc. Every year we looked forward to crossing over the FICA contribution limit, not just because I got to retain my part and redirect it, but also the business that I owned stopped paying the matching 6.25%, which was my money in a different pocket. For years now, Medicare’s 1.45% has come out of ALL our income and there is a regular drumbeat for lifting the contribution limit completely on FICA. This would presumable swell the revenue to a point which would satisfy the feared decline of the Trust Fund. But man! 12.5% coming out of every dollar available to me would be a HUGE headwind for investment in my own assets for my retirement. I haven’t heard any suggestion that the profoundly higher cost for an individual would be made up in anyway by a better Social Security benefit. And just to add a bit of insult, my wife’s work experience included state employment outside the Social Security system. That is punished by the windfall elimination provisions (WEPs) and GPO rules which all but eliminate her own Social Security benefit and most of any potential spousal benefit as well. Being in a position to pay taxes is, of course, the better alternative compared to being “saved” by poverty. But I agree, there is a lot of unfairness in the system. Social Security benefits should not be taxed at all, we already paid tax on it! For example, taxation of Social Security benefits began under Ronald Reagan in 1983 and were increased under Clinton. Larry needs to do a little more research.